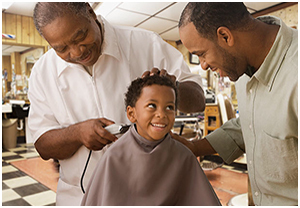 People of all ages can go for a walk, shop for healthy food and find the services they need (such as getting a haircut, like the cute barber shop client at left). Look and learn from our latest livability slideshow. When you get to the end, check out the downloadable graphic we created to help you "show and tell" others how a livable community can be a lifelong home. 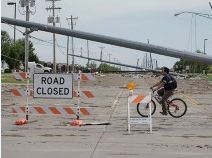 When roads are closed to motor vehicles (as Brownsville, Texas, left, does several times a year), people can safely walk, bicycle and even dance in the streets! When a destructive tragedy occurs, the rebuilding plan can include the types of features and services that enable people of all ages, physical abilities and life stages to comfortably call the community home. Learn how, and see before and after "photovisions" of ways four real streetscapes could be so much better. 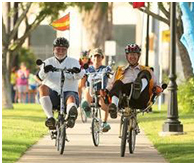 Efforts are underway throughout the country to make it easier and safer for people of all ages to get around on their own two feet. 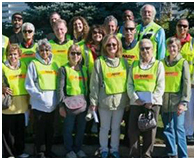 Community walk audits, which sometimes involve wearing an AARP safety vest (pictured), are part of the mix. Joel Russell of the Form-Based Codes Institute explains why zoning based on the shape and relation of buildings rather than on their use reduces sprawl and seclusion — and enhances the efficiency and vitality of cities, towns and neighborhoods.